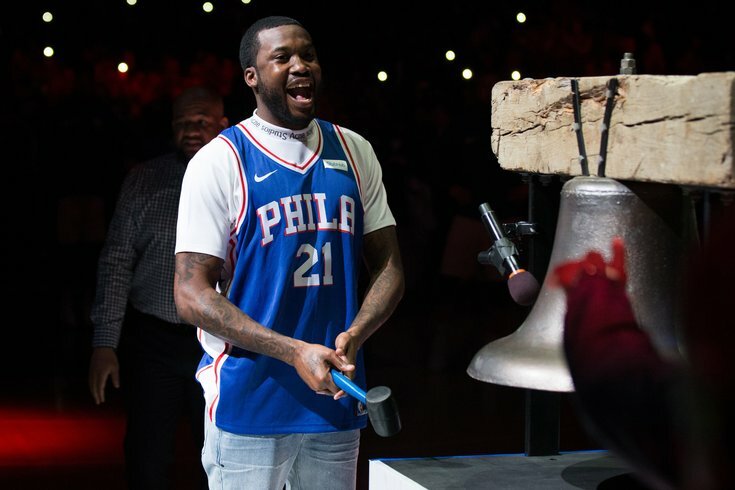 Rapper Meek Mill rings the bell before action between the Philadelphia 76ers and the Miami Heat in game five of the first round of the 2018 NBA Playoffs at Wells Fargo Center. Rapper Nicki Minaj is among this year's headliners for the 2018 Made in America Festival on the Benjamin Franklin Parkway. So is Philadelphia native Meek Mill, free from prison but still on probation and fighting a decade-old drug and gun conviction in court. Will there be an amicable reunion, or is it still too awkward? Mill and Minaj famously dated before breaking up in early 2017. According to recent interviews, Mill might still have a bit of a beef with Minaj in regards to his legal situation. Mill's lawyer claimed that Philadelphia Common Pleas Court Judge Genece Brinkley, who sentenced Mill to two to four years in prison for violating his probation, has a personal vendetta against Mill, partly because she asked the 30-year-old rapper to remake a Boyz II Men song in her honor but he refused. According to Mill, Minaj was in the meeting where Brinkley asked him to cover the song. But Minaj has avoided talking about her specific interactions with Brinkley. During a recent interview with Power 105.1's The Breakfast Club, Mill expressed frustration with Minaj for not publicly discussing Brinkley's request, as he suggested doing so would help people realize he's not lying about it. "What type of lie is that to make up?" he said, adding that "somebody else was there but they said they don't want to involve themselves in it," referring to his ex-girlfriend Nicki Minaj. It will be interesting to see if the two appear on stage together during the annual festival, which will take place Sept. 1-2. Also headlining this year's two-day show: Post Malone, Diplo, Zedd, Miguel, Janelle Monae, Allesia Cara, Fat Joe and 6lack. A full list of performers can be seen below. A list of the headliners for the 2018 Made in America Festival on the Ben Franklin Parkway in Philadelphia. A list of performers for the 2018 Made in America Festival on the Ben Franklin Parkway in Philadelphia.